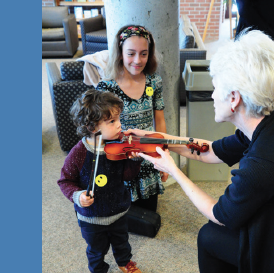 Our 59th season is in full swing, and so are our outreach activities! September 2017 brought the addition of double bassist Gay Lee Ludwig-Bonney to the KCCO outreach duo of Jennifer Mitchell, violinist, and Don Goldenbaum, violist. 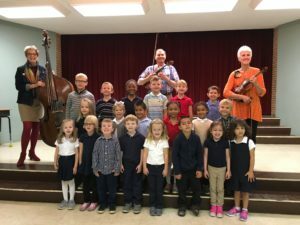 The trio performed and interacted with over 750 students in preschool to grade 3 at several schools in the KC metro area in September and November. The free interactive programs were customized in length and content from 20-45 minutes, depending on the age and attention level of the students. 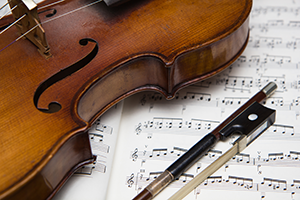 For younger audiences, the presentation demonstrated the differences and similarities between the three stringed instruments according to appearance, sound, and style. 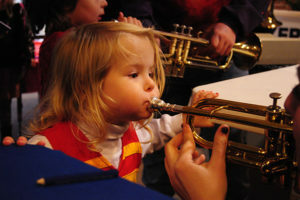 The musicians accompanied eager young students who sang beloved children’s songs such as “Twinkle, Twinkle, Little Star” and “The Wheels on the Bus”. For the older audiences, the “Seeing the Symphony” part of the program introduced students to the inner workings of an orchestra, comparing it to a sports team that requires a conductor as the leader or coach and that demands individual preparation of all the players. Rehearsals are like practices that prepare the group for the big moment, whether it’s a concert or a game. 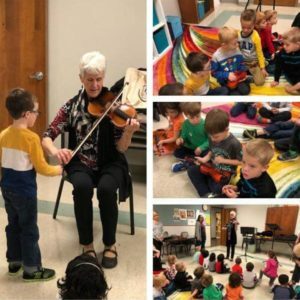 In addition to playing popular Disney movie songs and a spirited folk tune to the accompaniment of a recorded “orchestra”, the musicians welcomed all students to take turns helping them to cooperatively “play” a familiar tune. Students eagerly pinched the end of the bow and helped to push and pull it across the strings as the musicians fingered the tune. 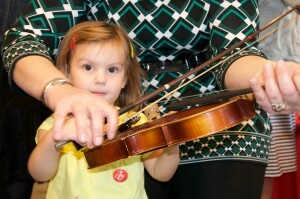 On November 11th KCCO held its fourth annual Instrument Petting Zoo – possibly our most popular outreach activity! Over 130 children attended and enjoyed getting their “passports” stamped as they toured through different stations where they learned about various instruments. 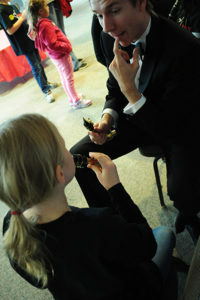 The instruments for the Zoo were kindly donated by Band of Angels, a non-profit organization that collects used instruments, repairs them, and then provides them free of charge to students in need. If you’d like to schedule an outreach activity for your school, send us an email! KCCO has officially kicked off our 59th season! For those who missed our first concert – Bold, Brass & Brahms – here’s just a small sample. 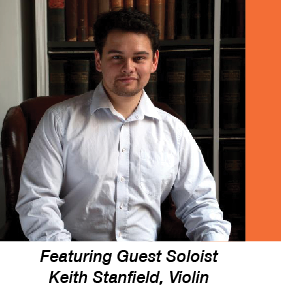 The video features guest soloist Keith Stanfield. Video courtesy of Gary Rohman Photography. The first concert of our 2017-2018 season is just over a month away! Saturday, October 14 at 7:30 p.m. Band of Angels is a collects music instruments and provides them to children in need for free so they can join band and orchestra programs. They also provide scholarships for area children to attend summer music camp. 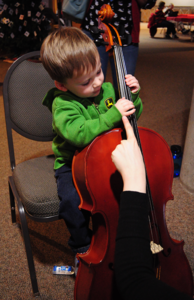 And, this November, Band of Angels will provide the instruments for our Instrument Petting Zoo. Thank you, Band of Angels! Planning for the 59th season is well underway, and the concert dates have been set! Look for information on the program for each concert in the next few days. KCCO is auditioning amazing musicians for our 59th season! Solo selection of your choice, between three to five minutes (no pianist provided, or required). Sight reading demonstration (three excerpts provided by audition panel). Horn auditions have additional requirements; click here to view horn audition info. Please plan to arrive with ample time to check in and warm up. Memorization is not required for your solo selection. Attend rehearsals every Tuesday evening. Perform in approximately seven concerts between September and May. Prepare for rehearsals and concerts and play to their highest ability. To audition, please complete the form below. If you have questions or would like additional information, please contact our music director, Christopher Kelts. 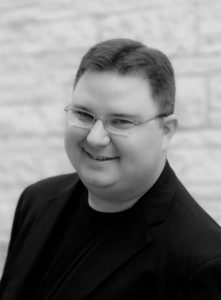 The Kansas City Civic Orchestra is pleased to welcome conductor Christopher Kelts back to the position of Music Director. After serving with KCCO for seven and a half years, Kelts resigned from the organization in December 2015 after accepting the position of Director of Orchestral Studies at Missouri State University (Springfield, MO). Between December 2015 and May 2017 KCCO enjoyed a successful 58th season performing under the baton of five guest conductors. As Kelts noted, this gave the orchestra a chance to experience artistic diversity, strengthen its musical talents, and expand its adaptability. The orchestra also hosted outstanding guest artists, featured the winners of its annual Young Artist Concerto Competition, and continued to grow its outreach efforts. After an extensive search for the right candidate to serve as music director, the orchestra and Board of Directors explored the possibility of having Kelts return to the position. Fortunately, he was happy to reengage with KCCO. 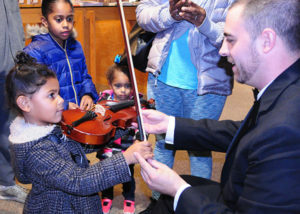 “I want to keep the orchestra on a path of strengthening its artistic and musical performance, expanding educational outreach, and continuing to build the audience community that shows us such amazing support,” he said. Information on the 2017-2018 season, including audition and concert dates, will be announced this summer.